Today is the Apodosis, or Leavetaking of Pascha, the Feast of Feasts. It is also two days after another leavetaking in my life: The End Of The Semester I wrote longingly of three weeks ago while still in the midst of the Paschal feast. It's interesting that, the first leavetaking is one I am sad to see arrive, while the second is one I am thrilled is finally here. Such is life I guess--to everything its season. That meeting, which occurred at the very end of April, went quite well. My professor helped clarify aspects of my topic that were throwing me for a loop (and thus making me feel like an idiot), and ultimately told me he wasn't worried about where I was with the paper, that I had things more under control than I thought. So, that was very encouraging, and it left me with almost three weeks to write the paper in time for its May 18th deadline. So, one week went by...and I had library-related projects that needed my attention that week. Another week went by...and our final exam was coming up and I needed to spend the bulk of my time studying for it. And suddenly it was the third week, and I had a handful of days to actually write the paper. 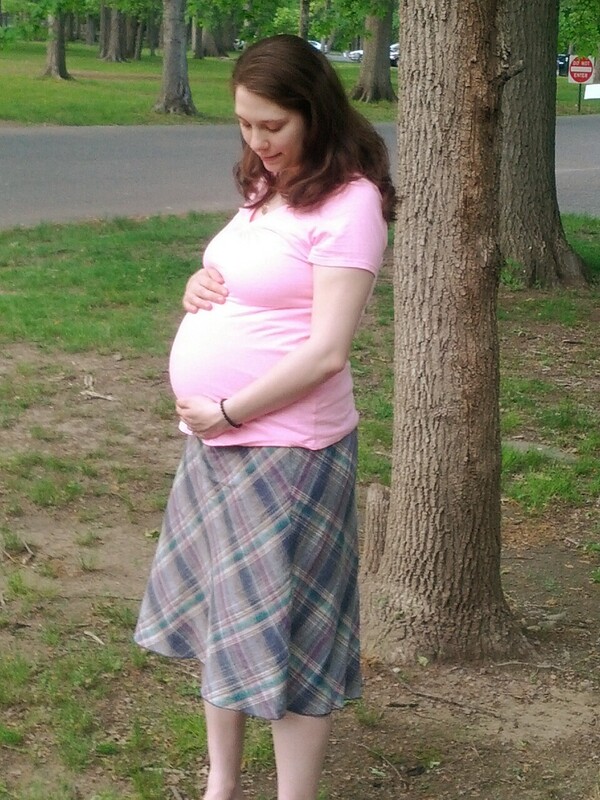 Now, it's worth noting again that, thankfully, I and the baby are both healthy. So the above experiences, while challenging for a first-time pregnant mother who is used to moving through life at a pretty fast pace, are thankfully not at the level of indicating anything being seriously wrong. They are just par for the course...and though I read about most of these prior to reaching my third trimester, I was naive enough to think maybe I'd be able to duck and dodge a few of them. Ha, yea right. "Ok, right now I'm going to tightly outline and then write the first section of the paper using all these great sources I've collected." "Man, I'm tired. Ok, now it's time to really begin what I said I was gonna do. Let's do this." "Oh my goodness I can't feel my feet." "Ok, let's pick up where I left off..."
"Babygirl I love you dearly and I've been waiting for you to kick like this for months, but please, can you be calm for just a little while so I can get some work done???" Needless to say, I did not meet the May 18th deadline, but luckily my professor was very understanding and gave me until as close to the grade submission deadline as possible to get it to him. That gave me the equivalent of three more days (i.e., this past weekend). Well, I am happy to report that, at 12:30 pm on Monday, I was able to give him something he could grade in time to post my grade to the registrar's grading system. Thus was the Leavetaking of my Spring semester. And thank God for it. At one point (well, on May 13th) amid all of this hubbub, though, I celebrated my first Mother's Day as a mother. (N.B. Anyone who reads the above and somehow can't see that carrying my little one around right now, while keeping myself healthy and sane for her sake, is a good example of what it means to be a mother, is out of touch with reality...). And since I like to include at least one picture with each of my posts, here's a shot of me that Paul took on Mother's Day, which was the day before my third trimester began. The third trimester (or thereabouts) doesn't look quite as hard from this angle, does it? May God grant the rest of your pregnancy be healthy! Thank you Kh. Nicole! It's good to know that I'll get somewhat used to interrupted sleep. Right now it is challenging, but it may also be because of my size and shape, since waking up in the middle of the night doesn't mean simply springing up to go to the bathroom or whatever the need may be--instead it means carefully rolling over and using very tired muscles to get up and do whatever needs doing. Not that I am complaining--I pray the above post doesn't come off as a complaint. It was more me observing in myself what this very humbling experience is like. Thank you for the prayers for the rest of my pregnancy--and I hope your 40 days have been/continue to be restful and enjoyable! I hope you are near the end of your grad program. When I was pregnant, the beginning of my third trimester coincided with the beginning of my first grad semester and I finished my 10-page final research paper just days before giving birth. Now, I am saying this not to brag, but to share something that wasn't apparent to me at that time (when I was desperately counting days till giving birth and returning to my usual productive self): school work is much-much easier during pregnancy than after pregnancy. My concept of possible vs. impossible got totally revolutionized with Anna's birth. This time around, 10-page research papers get written overnight (from the time baby goes to sleep till she wakes up, as there's no other opportunity). Thank you for the helpful and supportive comment, Valentina! I think it is absolutely spot-on that the words for "pregnant" in both Russian and Church Slavonic mean what they do. Makes perfect sense to me. Yay, so glad you'll be at the shower! Looking forward to seeing you then!